Last published Bitcoin analysis had inadequate targets. This analysis is published @ 03:33 a.m. EST. Volume alone is not always a clear indicator. It is necessary to add another volume indicator, like On Balance Volume, to add depth to volume analysis and improve accuracy. On Balance Volume can be used in two ways. 1. 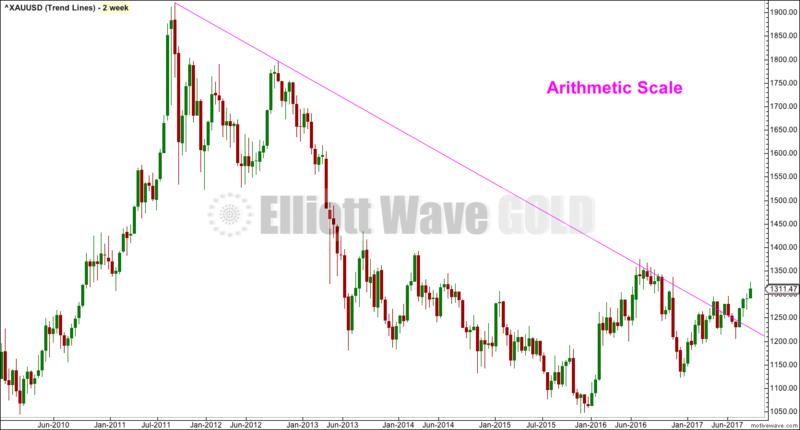 When On Balance Volume creates a range draw trend lines across its highs and lows. A breakout by On Balance Volume can sometimes precede a breakout from price, so On Balance Volume can be a leading indicator. Other times On Balance Volume may break out with or after price, it can then be a confirming indicator. Used this way On Balance Volume works very well. 2. Divergence between price and On Balance Volume can be used to indicate weakness and an impending trend change. This divergence can persist for some time prior to a trend change, so it is not useful in picking highs or lows. Trend lines are drawn on On Balance Volume in the chart above. Resistance is in purple, support in yellow. 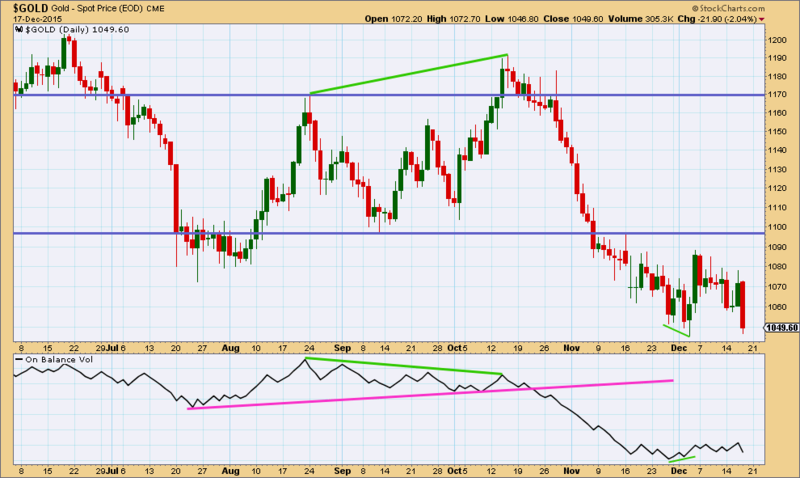 A long term line is added in pink. 1. Halfway through an upwards trend On Balance Volume breaks above resistance which was prior support. This adds some confirmation to the trend. Traders may have more confidence in long positions. 2. 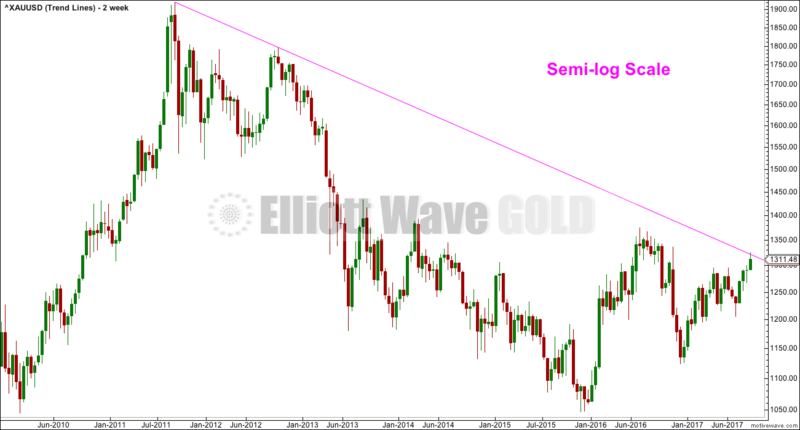 A long term trend line which previously provided support, then resistance, is breached. This adds confidence in the upwards trend continuing. 3. A long term trend line is touched after some time. The bounce up and away is bullish. 4. A breach of resistance is a bullish signal. This illustrates that this technique does not always work. Price continued higher for only one more day before a major reversal. 1. 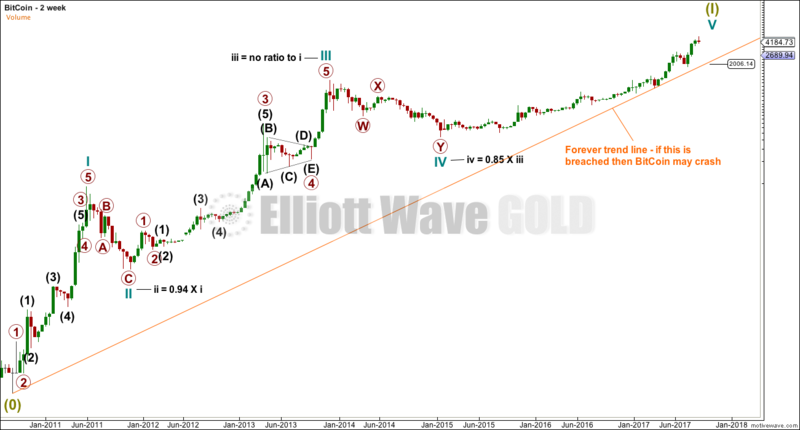 A breach of support is a bearish signal, which should confirm the downwards trend. But a low is found the next day. Again, this technique works more often than it fails, but it can fail. 2. A break of a long term support line halfway through a downwards trend offers confidence in short positions. 3. Another break below a support line offers confidence in the downward trend. In addition to breaches of trend lines, tests of support and resistance also offer signals. Using On Balance Volume in conjunction with volume bars adds considerable depth to analysis. This analysis is published @ 03:41 a.m. EST. The activity of buyers is required for price to rise sustainably. 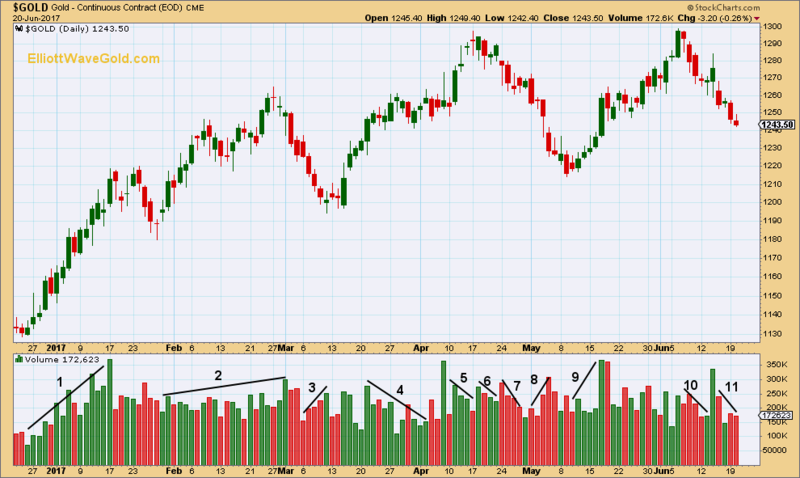 This is indicated by increasing volume on upwards days. The opposite isn’t necessarily true for a falling market. Price can fall due to an absence of buyers, just as it can with increasing activity of sellers. Rising volume with falling price is good to see as it supports the trend, but it is not necessary. 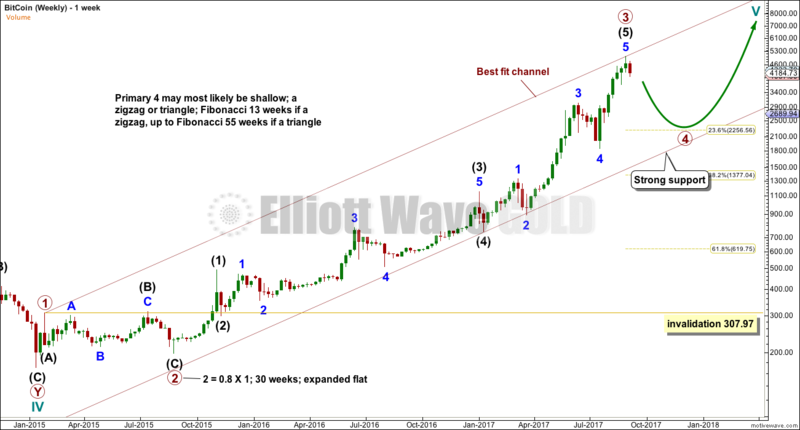 Does Gold’s price and volume conform to this basic principal of technical analysis? 1. This first rise in price is close to textbook perfect. The trend is well supported by volume. Volume does not increase in a straight line each day; some days are lighter than the prior day, but overall there is an increase. 2. This next rise is not so clear, but there is still overall an increase in volume as price rises. Volume is lighter than the prior stronger trend though, so the deep pullback that followed should not have been entirely unexpected. 3. As price falls initially volume declines and then shows some steady increase. The fall in price has support from increasing selling activity. 4 & 5. As price rises volume is not clearly rising. Sometimes the market can drift higher on light volume, so this type of rise is suspicious. The following deep decline again should not have been entirely unexpected. 6 & 7. As price falls volume declines. The market is falling of its own weight. 8. At the end of the fall volume begins to increase. 9. The start of the next rise has some support from volume by day 5. This shows an increase. However, the fifth day volume spike may also be a blow off top signalling an end to the rise temporarily. Blow off tops are not usually the very end; they usually signal a period of consolidation before the trend has a final rise. The area between 9 and 10 is very unclear, with choppy overlapping price action generally trending higher and mostly flat volume. 10 & 11. As price falls volume declines. The market is mostly falling of its own weight. When volume clearly supports a trend, then more confidence may be had in it. When volume does not support a trend, it is suspicious. Lack of support from volume will not tell when price will change direction, but it can warn that price may likely change direction and not just consolidate. This analysis is published @ 03:51 a.m. EST. The other alternate idea of a leading expanding diagonal published up to yesterday will be discarded based upon a very low probability. At any one time a market will be doing one of two things: trending or consolidating. A trader’s approach needs to be different to each type of market. If trend following systems could avoid the whipsaws of a consolidating market, then unnecessary losses can be avoided. ADX offers a solution. It helps identify which type of market is current. Welles Wilder developed the concept of directional movement in 1978. 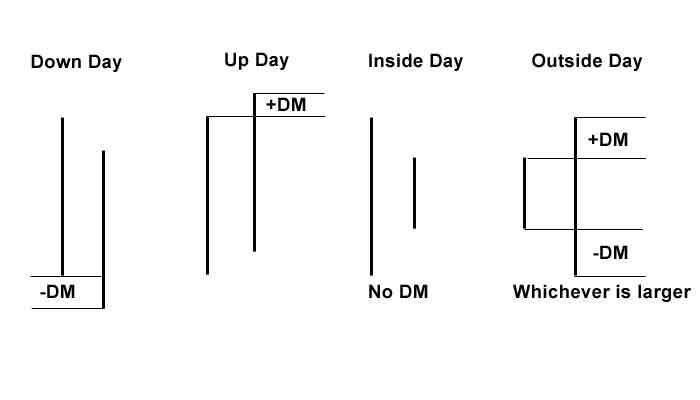 Directional movement compares two trading periods (usually daily, but it may be used on all time frames). A moving average of +DM and -DM is calculated; the standard time frame is 14 days. This creates the +DX and -DX lines in the ADX indicator. The +DX and -DX lines can be used in (at least) two ways. 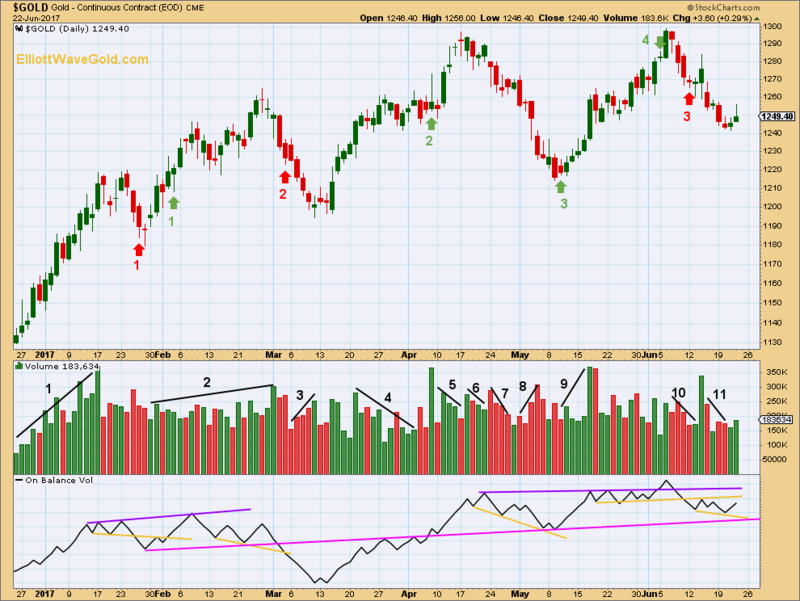 Whichever is uppermost indicates the direction of the trend; if the +DX line is above the -DX line the trend is up and vice versa. When the DX lines cross a potential trend change is signalled. When a market moves from trending to consolidating the DX lines will come close together and fluctuate about each other. ADX is bound between 0 and 100. Generally, high and increasing levels indicate a trending market and low and falling levels indicate a consolidating market. There are no commonly agreed upon rules, so it is up to each individual trader to test their own rules to determine which approach fits their trading style and preferred market. Below some guidelines are offered as a starting point. These general rules for using ADX were originally provided by Ashwani Gujral. 1. 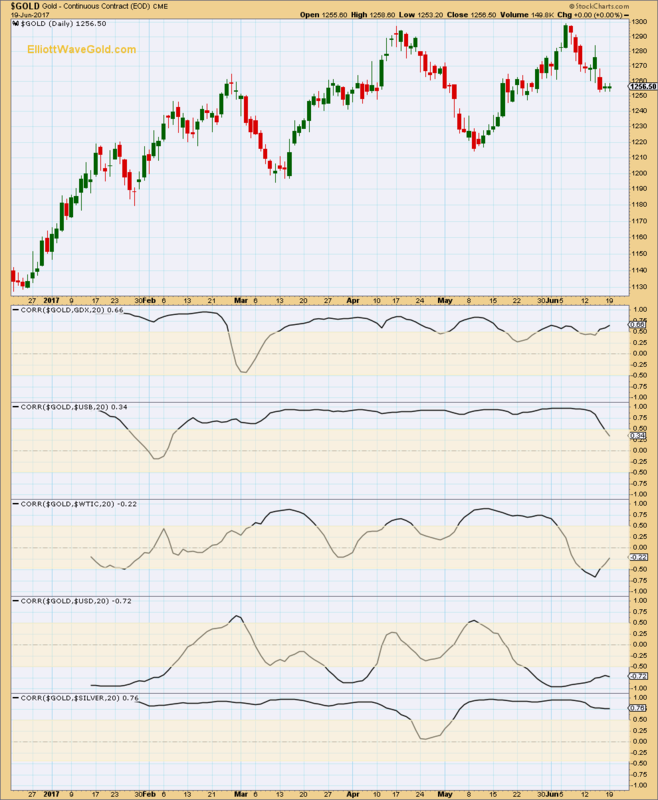 If ADX crosses above 25 the market is trending. 3. If ADX crosses below 45 after being higher, the market is consolidating. 4. If ADX rises above 10 on 3 of 4 days after being lower, the market will start to trend. 5. A trend based on rule 4 remains in effect until the 5 day difference in the ADX is less than zero. Because ADX and +DX and -DX are based on moving averages of +DM and -DM, it suffers from the effect of lag that all moving average systems have. The standard period to average is 14 days, so a new trend will not be indicated until well into the first two weeks of it. References: Kaufan, P. Trading Systems and Methods; Kirkpatrick, C and Dahlquist, J. Technical Analysis: The Complete Resource For Financial Market Technicians; Pring, M. Technical Analysis Explained.